Tower defence games haven't exactly been a popular genre for long, but they're already starting to become boring to most. After all, fending off endless waves of enemies by strategically placing turrets is fun the first time, but any more than that and it might start to get annoying quite quickly. 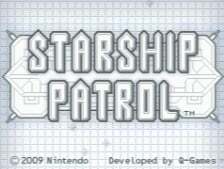 With Starship Patrol, has Q Games successfully managed to make the genre fun again? 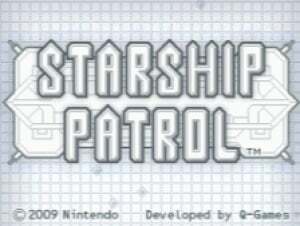 Starship Patrol doesn't stray too far from the basic formula. Enemies attempt to make their way through your terrain (in this case, a fleet of starships), and you've got to place a variety of guns along the way to take them down. Each weapon costs some energy, of which you gain more by defeating enemies, so you should always look carefully at which enemies are coming next in order to see if you need to buy anything specific. If enemies go far enough without being destroyed, they will deal some damage to your ships, and if it's all gone, you lose. Luckily, there's plenty of power-ups to help you out. Periodically, one will come floating down — among them you'll find ones that repair ship damage and a variety of stat boosters that can be dragged to any weapon in order to enhance an attribute, such as recharging speed or power. You'll start off with very basic turrets — a precision laser that does minimal damage but is the only starting weapon that can hit cloaked enemies, a missile launcher and a chaingun. As you go through the game you'll get more and more to use, and carefully managing placement becomes more difficult. They're actually not the only weapons at your disposal, however — if the going gets too tough, you can send out an S.O.S. call, which allows you to use a special item gained after beating a level. You can call in support from a bounty hunter, give yourself extra energy to purchase things with, or simply repair damage. But be warned, there is a minor penalty attached to this! Just like in Reflect Missile, you are awarded a medal if you perform exceptionally well in a stage — in this case, finishing it without using an S.O.S. call and without letting a single enemy escape. The game has about 30 stages, which will take you a while to finish. It's possible that there might be more after them, but some of the later levels are quite challenging, and as such we haven't managed to finish them yet! However, it could also just be because we want a medal on every stage and thus spend numerous attempts trying to get one. 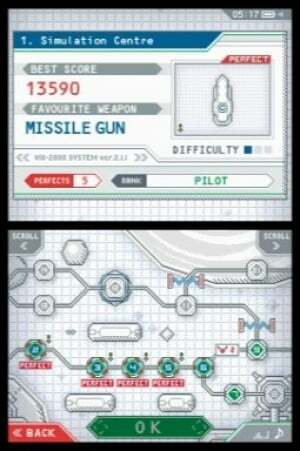 Like with their previous DSiWare titles, Q Games has given the game a very minimalistic style; everything looks like it takes place on paper used for mathematics. All enemy designs are simple and only consist of one colour, while your turrets also look very simple yet clearly different, with colours denoting the upgrade they're using. The music is a bit low-key and won't really impress, but it's not bad. 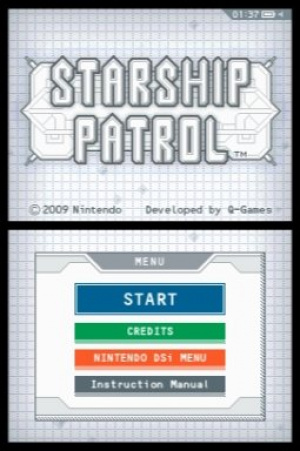 Q Games has increased their streak to three — Starship Patrol is yet another great addition to the DSiWare library and a game you should definitely consider picking up if you have the slightest bit of interest in the tower defence genre. Like Reflect Missile before it, the art style works greatly in its favour, giving a very simple yet uniquely charming look, which somehow manages to make the game more interesting. Although there's only one mode to speak of, the ability to earn medals and possibly unlock more or to simply earn bragging rights will keep you coming back. Might wanna change that header image dude, it's got Star Trek written all over it. I am one disappointed nerd. Don't worry, it's Enterprise NX01 so it won't be good. That header image should be either The Ark or The Nemesis. Great review Drake and this is now on my wanted list. Starship Patrol and Reflect Missile are definite must have games for me. I just can't wait to play both of them. Also, I love that eccentric robot assistant that guides you through the game! Reflect Missile and Starship Patrol! And alos, I can't wait for the next Q-Games game! Yes! Can't wait. Love Tower Defense. I too was wondering about the Enterprise... where'd you get that picture? More importantly why is it here? That squared paper look is seriously compelling. Really wishing I had a DSi about now, that's got to be an insta-buy in my books. I has a feeling that this may be good. I think I'll be downloading this little number. Thanks for the revw. i want to get this, when is it coming out? Downloaded it. 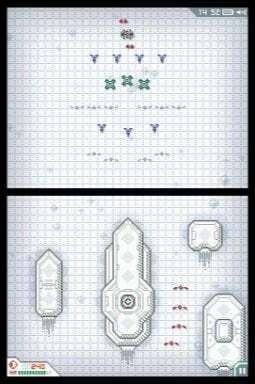 Very good DL ware strategy game. Ideal for DSiware. Simplistic look but very well presented and actually has a reasonable depth. this game is what I consider to be a one and only game worth the name of "Christmas update from Nintendo" on DSiWare.. dont really understand why 8, it must be 9, because its so f*****g great!!! let us see - art is very cool, music is cool and atmospheric, gameplay is addictive, chalenging and fun, the medal system is very cool (because you can skip through without medals but in that case you always know you are a looser ). so why 8? Wow, Q-Games is on a hot streak indeed! Instead of rushed-out shovelware, game devs are (finally) taking their time to produce quality games for the DSiWare service. Q-Games sets a nice standard for other devs out there who aspire to develop such titles for the service. @Heywood: For me, this is like a Tower Defense game with a twist - I don't usally like TD games, but this is a great game with great value. Try a YouTube Video if you want to see how it's played. This and Dark Void Zero today - so good! Not a star trek game! there should be one! Oh yeah, I am getting this when I get some more points. 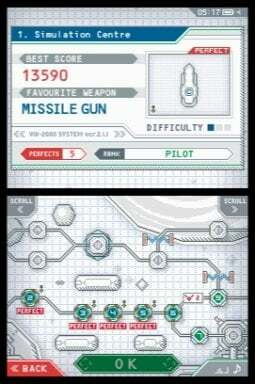 I got Vector TD(RTS game) on PSP a few days ago and I love it . Towerdefense games are cool but they get boring when finished several times.. il postpone this one. Might have to pick this one up on Club Nintendo. @Bobpie Did you get it? Did you like it as much as I did?